Do you: Often snack on junk food, watch too much T.V., spend too much money or binge eat? Wish you could stop smoking or drinking excessively? Have a small (but annoying) habit you’d like to break? We all have a specific bad habit we’d like to break. Odds are, you’ve tried in the past and maybe you were successful for a few days. Then something unexpected came up where you slipped for a day or two. One mistake snowballs into a series of setbacks. 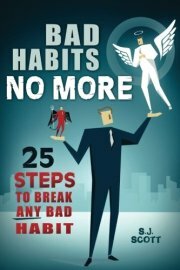 Eventually you give up on the idea of making a habit change simply because it’s too difficult to do. The interesting thing? We’ve all experienced this pattern at some point in our lives. Fortunately there’s a quick fix: Make a plan for breaking that habit and follow it on a daily basis. RIGHT NOW:: Pick a Bad Habit, Make a Plan and Start Today! It doesn’t matter if you’ve failed with your habit efforts in the past. It doesn’t mean you’re lazy or weak-willed. It means you didn’t have the right tools for making a lasting habit change. You don’t have to be controlled by bad habits. You can break them by following a step-by-step blueprint. Download now and take that first step to breaking that specific habit.